Getting all the family members to their associated parties and activities over the holidays is a nightmare unless you plan. It is important that you take note of all the different activities and check that not only can the person attend but there is transport too. There is nothing worse than telling a child that while they are free to attend the party there is no way of getting them there. You must come together and be flexible but also understand that not everything will be possible, sometimes there is a clash and while you will try your best to schedule, sometimes things are just not possible. There are always events and parties that you must attend and it is important to mark these in for the family as early as possible, noting down all those who have to attend, too. If you all add the most important items that you know in advance, if there are any clashes you have time to sort out how to resolve the problem. It could be a lift to a party or collection time is difficult, if you are aware of the problem first-hand then it is easier to find a solution rather than a last-minute rush. It is important to instill into all family members they need to check their commitments before they can agree to any changes in the schedule, this can have an effect on the family and it is important that you discuss before a change. If it is something work related, a change in a shift pattern for example, and this can’t be helped, but the more notice you have for the change the easier it is to reschedule items already planned. The holiday season is a fun and exciting time and it is important to be as flexible as possible. It is difficult trying to fit in all the activities that happen at this time of the year; you might feel that you are doing nothing but running around going to different events and parties, if you have scheduled your calendar properly then you will make it through, I promise. The more that you can schedule the better prepared you will be. If you have to purchase gifts or clothes before a special advent then it is important that you schedule time to allow for this to happen. How many times have you seen someone frantically buying a gift, card, wrapping paper and tape with a young child getting agitated as they’re excited for a party. The parents are then hurriedly trying to wrap the present while sitting in the car? It is possible that you can avoid this scenario if you have carefully planned your schedule and included the gift buying in plenty of time of the event. Don’t forget to schedule in normal activities and when they stop and start again after the festive season, you might have more free time than you realise when some of the activities that you participate in, stop for the holiday season. It is easier to manage the holiday season and organize your whole family’s schedule, only if you are able to put it together to ensure that each person is able to attend the most important event for them. You might have to disappoint for some activities but if you try to get the ones that you must attend scheduled as early as possible into your diary, it is easier to see the commitments that you already have and work on fitting in everything else as it comes along. 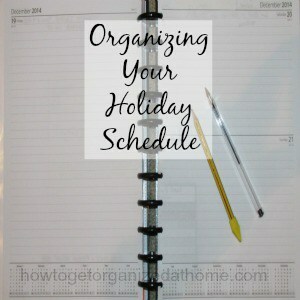 Planning is the key to any successful holiday schedule.